Sarcoidosis is a disease characterized by the presents of the areas of inflammation (granulomas) in different organs and tissues. Sarcoidosis almost always involves the lungs, but it can be seen in the skin, eyes, nose, muscles, heart, liver, spleen, bowel, kidney, testes, nerves, lymph nodes, joints, and brain. The cause of sarcoidosis is unknown. It can occur worldwide, in all races and sexes and most commonly in young people aged 20 to 50. Most of the people with sarcoidosis have inflammation in the lungs that shows as abnormalities on the chest XR (so called hilar adenopathy or infiltrates). Some patients with sarcoidosis have high levels of angiotensin-converting enzyme, so called ACE in the blood (40-90% by different studies). Since there is no single test that confirms a diagnosis of the sarcoidosis, it is based on signs and symptoms, abnormalities on chest X-ray (or CT scan), and biopsy (example, lung). A biopsy involves removing a small piece of tissue from an organ to look under microscope. 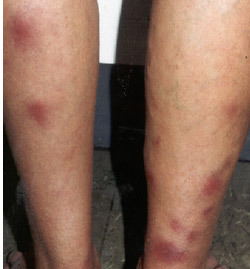 The Lofgren’s syndrome is the presence of the erythema nodosum, chest XR changes and acute arthritis (most commonly in ankles and knees). It has a good prognosis with more than 90% chance of going away on its own. There is no specific treatment for sarcoidosis. Many patients with sarcoidosis require no treatment since the granulomas gradually go away. Treatment is usually recommended in patients with worsening lung problems, especially severe shortness of breath and cough. It is also treated if there is a significant decrease in daily living activities because of the fever, weakness, fatigue, joint pain, nervous system changes, severe skin rashes, or disease affecting the upper airway. Sarcoidosis affecting the eyes, heart, or kidneys is treated even when symptoms are mild. A cardiac pacemaker may be needed in patients with cardiac sarcoidosis. See also “Useful links” for sarcoidosis foundation website.